This is an impeccably presented, tastefully restored and extended Welsh Long House dating back to the 1600's. This characterful and deceptively spacious family accommodation retains a wealth of original features yet has been thoughtfully improved with modern conveniences. There is a wood pellet boiler which runs both the underfloor heating and the radiators. The 'Duck Egg Blue' Rayburn in the Kitchen is a particularly striking feature providing the perfect focal point in the most welcoming and sociable area of the house. There are 2 woodburning stoves, one of which enhances the Conservatory in winter months and the contemporary 'Pure Vision' stove in the Sitting Room is a superb addition and sits within an inglenook style fireplace. There is an iconic Lounge/Studio with a vaulted ceiling and deep picture window with far reaching views. There are also useful Utility areas, Cloakroom and Pantry. 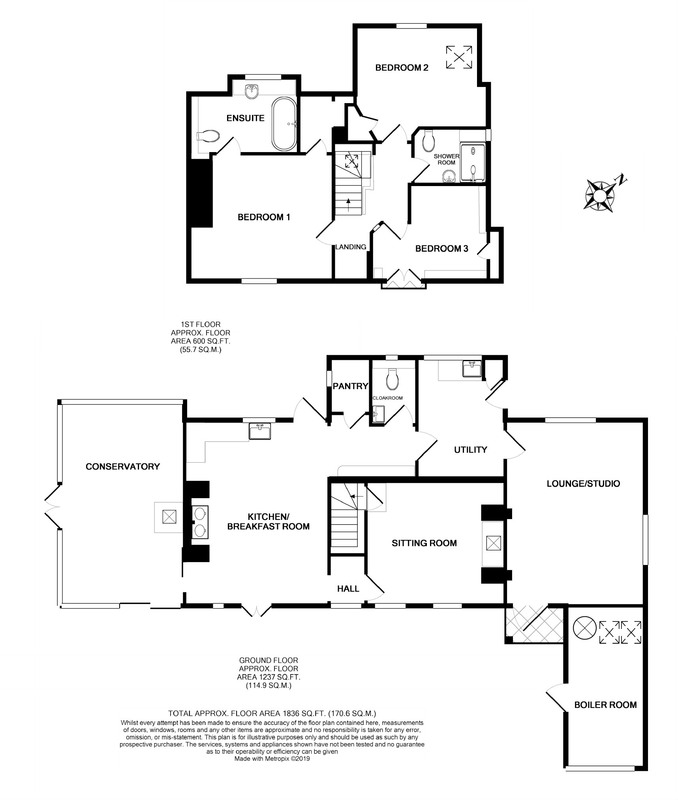 The 3 Bedrooms (1 En-Suite) and Family Shower Room are on the first floor. Externally the location of the property can only be fully appreciated on viewing with a completely undisturbed outlook and far reaching views enjoyed from every aspect. The property stands within delightful grounds with pleasure gardens, pond and seating areas. There is a polytunnel and barn to the rear. The plot extends in all to approximately3.75 Acres(or thereabouts) with useful and productive paddocks laid to permanent pasture, orchard and mobile home. The land is ideal for grazing, further cultivation or development of various leisure enterprises, subject to the necessary permissions being obtained. Access to a "restricted by-way" makes the property particularly appealing to persons with equestrian interests. Being only one mile from the centre of Bishops Castle the location will appeal to discerning purchasers seeking the perfect balance of peace and tranquility with ease of accessibility. The county town of Montgomery is approximately 8 miles away. Ludlow and Shrewsbury are 20 miles and 24 miles distant each respectively with public transport services. Bespoke Hardwood Conservatory: - 6.25m x 3.75m (20'6" x 12'4") - A most inviting entrance which is naturally well lit with panoramic outlook and windows to three aspects, substantial cast iron woodburning stove, 'Fired Earth' rustic floor tiles, ceiling light and fan, sliding doors to the front approach and french doors leading out to the side gardens. Family Kitchen/Breakfast Room: - 5.50m x 4.25m (18'1" x 13'11") - Being the heart of the home and a particularly sociable space, inglenook style recess with oak beam and hand painted tiles to recess with inset lighting, 'Duck Egg Blue' oil fired Rayburn of striking design, a favourable cooking source and stand alone heating appliance. Butler sink with mixer tap and freestanding units with shelving and work surfaces, original window to the rear view, marmoleum floor, exposed ceiling timbers and spotlighting, oak framed french doors to the front flagstone patio and oak half glazed stable door leading out to the rear. Vestibule: - 2.52m x 1.55m (8'3" x 5'1") - With low level shelf, 2 pendant lights. Walk In Pantry: - 1.60m x 1.10m (5'3" x 3'7") - Pendant light and double glazed window. Cloakroom: - Low level W.C., Victorian style wall mounted wash hand basin, pendant light and extractor fan, obscure double glazed window. Utility Room: - 3.50m x 2.60m (11'6" x 8'6") - Butler sink with hot and cold mixer tap, timber drainer to side with plumbing point for washing machine, low level shelf, pendant light, and ceiling spotlight cluster, built in storage cupboard, double glazed window to the rear and double glazed external door giving side access. Lounge/Studio: - 5.55m x 4.15m (18'3" x 13'7") - An impressive reception room which is suitable for various uses having naturally beneficial acoustics with magnificent vaulted ceiling and exposed purlins, fireplace feature, underfloor heating, oak double glazed window to the rear and oak stable door to the front forecourt. Stunning oak double glazed picture window to the side with far reaching views across the Camlad Valley to Heath Mynd and the rolling hills beyond. Inner Hall/Study with open outlook to the front. Sitting Room: - 3.85m x 3.35m (12'8" x 11'0") - A charming room, inglenook fireplace with flagstone hearth and oak beam above, contemporary 'Pure Vision' wood burning stove inset, underfloor heating, wall light point, 2 oak double glazed windows to the front garden view with deep reveals. Landing: - Balustraded gallery to stairwell, radiator, vaulted ceiling with conservation roof light. Master Bedroom: - 4.25m x 3.75m max (13'11" x 12'4" max) - Radiator, exposed floorboards, pendant light, walk in wardrobe, oak double glazed window to the front with far reaching views. En-Suite: - 3.00m x 1.75m (9'10" x 5'9") - Freestanding roll top bath, inset wash hand basin, low level W.C., Wainscot style wall panelling, heated towel rail, ceiling light point and extractor fan, double glazed window to the rear. Bedroom 2: - 3.65m x 3.00m (12'0" x 9'10") - Radiator, double glazed window to the rear, shelving alcoves and built in wardrobe and storage, conservation roof light with valley views extending to Heath Mynd. Bedroom 3: - 3.20m x 2.65 (L Shaped) (10'6" x 8'8" ( LShaped)) - Original wall plate with oak shelf, radiator, built in wardrobe, shelving niche, pendant light, oak double glazed doors to Juliette Balcony with a superb undisturbed outlook across the gardens to surrounding views. Family Shower Room: - 2.15m x 1.70m (7'1" x 5'7") - Large mosaic tiled shower cubicle with mixer shower, wall mounted wash hand basin, low level W.C., heated towel rail, vanity wall spotlights, glazed light to the side view. Outside: - The property enjoys a particularly private position yet remains easily accessible at the head of the council maintained 'No Through Road'. To the fore is a private parking area to both sides of the house and a paved patio spans the front of the house with outside taps and lighting. Timber Clad And Slate Boiler House/Workshop: - 5.00m x 1.75m (16'5" x 5'9") - 'Nibe' Wood Pellet Boiler which serves both the radiators and underfloor heating. Quarterly renewable heat incentive is paid in favour of this with a term unexpired. Hot water cylinder, power and light laid on. From the flagstone patio the garden extends to lawned areas which provide for a variety of interest with gently undulating contours and natural pond. Dry stone wall to 2 tiered lawned garden to the side leading to the rear. A pasture paddock runs from the front to the side of the conservatory and is well fenced. Lawned rear garden with polytunnel. From the council maintained lane access is provided to a Mobile Home with potential for a variety of recreational uses. 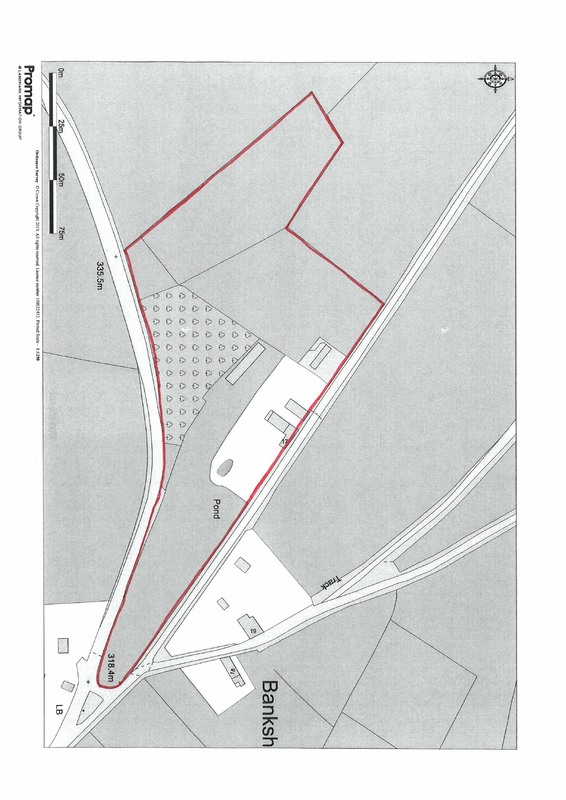 The remainder of the land is arranged as an orchard and 2 paddocks laid to pasture with the grounds in total extending to approximately 3.75 Acres or thereabouts. The land provides a great degree of privacy and enjoyment to be afforded with ample opportunity for further cultivation. Immediate access to the "restricted by-way" will be of considerable interest to persons with equestrian interests in addition to the grazing of domestic livestock. The sale also offers with this rare lifestyle opportunity the further development of leisure enterprises subject to obtaining the necessary permissions and consents. Services: - Mains electricity and water, private drainage to septic tank. None of the services, appliances, central heating system, chimneys, flues and fireplaces have been checked and no warranty is given by the Agents. Outgoings: - Council Tax Band ' D ' (Shropshire County Council) Website enquiry only. Route Directions: - From our Bishops Castle Office travel along Welsh Street out of town towards Banks Head. On reaching the green triangle bear right for Upper Broughton then take an immediate left up the council maintained 'No Through Road' . The property is the first and only house on this short lane. Morris Marshall & Poole With Norman Lloyd - 01588 638 511 - DTLJ- 28/03/19.